This month we turn our attention to open source mobile platforms. If you want to avoid the Google integration of Android, there's Cyanogen Mod, whilst Firefox OS and Sailfish can breathe new life into your ageing handset. Elsewhere we talk to Google's Director of Open Source, Chris DiBona, and quiz him on open source's impact on Google. If you're after a glimpse of what the future holds, Les Pounder looks at the new initiative that's teaching the next generation of coders, whilst Graham gets his hands on the Dell XPS 13 Developer Edition – Dell's new Ubuntu-powered Ultrabook. 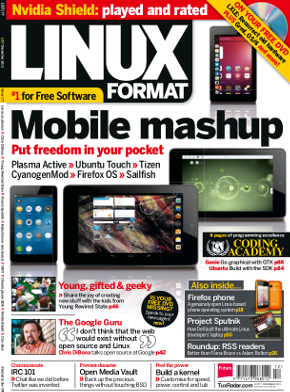 We've also got top-notch coding tutorials, the latest reviews and more, only in Linux Format! On the DVD: LXLE, OS/4 OpenLinux and Grml. Plus hotpicks, code books and more.